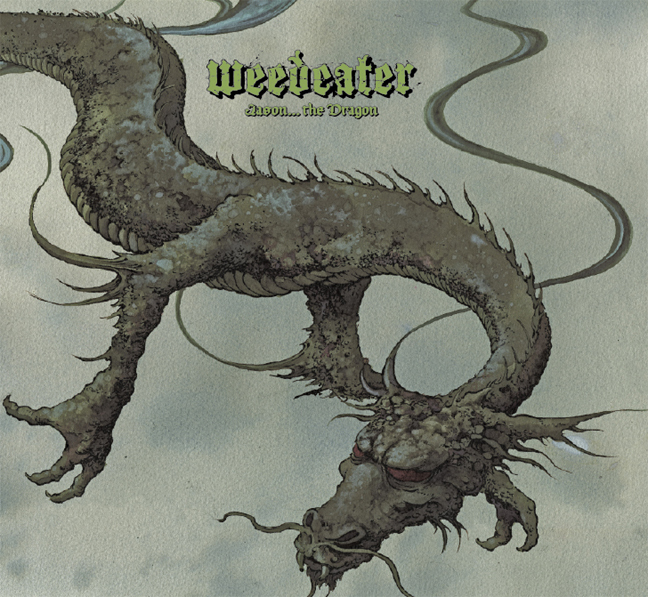 METAL MONDAY: Weedeater’s Awesome JASON THE DRAGON! North Carolina’s metal-dudes Weedeater do not mess around. Their fourth album, their epic album JASON THE DRAGON was delayed in 2010 when their lead singer, “Dixie” Dave Collins accidentally shot his big toe off…with a shotgun. Thank God Collins was able to pull himself together to record again, because JASON THE DRAGON is the kind of album the world needs. Metal is dominated by bands that are loud, in-your-face, and angry but often have no underlying spirit. I love music that grooves besides just assaulting the ears with sheer bombast, and Weedeater is all about groove. Their music is a slow-burn of aggression; it feels more complex and mature. Don’t look so smug Smaug. Weedeater occupy the sub-genere of metal known as sludge, which I seem to have an unhealthy love for. The sounds are dark, gloomy, and akin to a slow beating with a blunt object. “Turkey Warlock” is the epitome of this slow descent into madness, with it’s Black Sabbath-like chugging guitar and scratchy vocals. The song ends with a single held-note that bleeds into the next song, the titula “Jason…the Dragon.” I absolutely love this song. It’s about a dragon, name Jason…but more than that, it’s heavy but has a nice, steady groove. Weedeater is rock slow and steady and are unapologetic about it. The southern/bayou-sounding “Palms of Opium” sounds like the sort of laid-back country-jam ZZ Top used to be known for. It’s a refreshing blast of cold water on their fire of metal, and creates a surprising shade of complexity over JASON THE DRAGON that belies their chosen genre. Likewise, the John Bonham-esque “March of the Biploar Bear” offers up an entertaining (albeit brief) interlude. The best song on the album though, is “Homecoming” which is full of really interesting guitar work and home to the album’s most memorable riff. JASON THE DRAGON then ends with a frogs ‘n banjo song “Whisky Creek,” which similar to “Palms of Opium” reminds us of the bands backwoods roots. There’s something awesome about a hillbilly metal band, hearing it is like scratching an itch you didn’t even know you had. Bravo, Weedeater! Please stop shooting yourself and make another album ASAP.